Are you are a French Toast or a pancake breakfast person? I go through phases. I love a big good ol’ brunch on Sunday and usually end up whipping a batch of one of my go-to pancakes recipes. But sometimes I seriously crave thick, soft, golden brown, slightly sweet, eggy (which is ironic since this recipe is egg-free, ha!) vanilla and cinnamon infused French Toast. This Vegan French Toast with Berry Compote is ALL of the above guys and more. 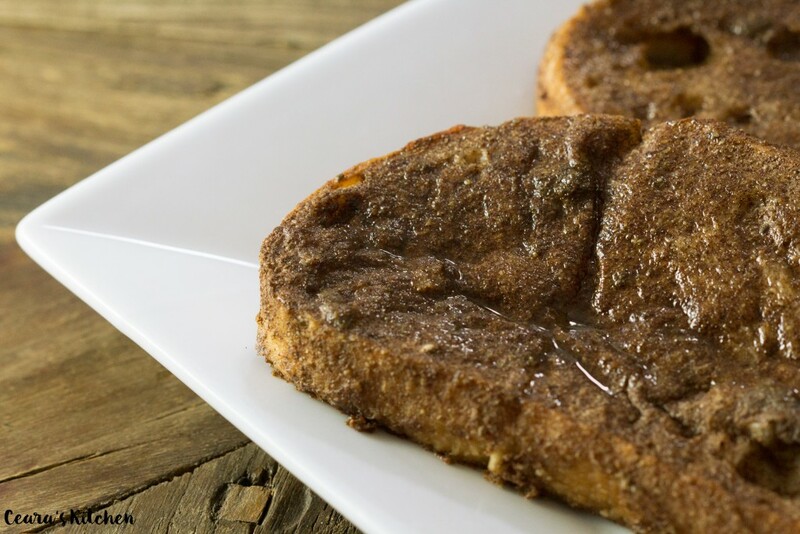 It’s my “always-handy” Vegan French toast which seriously makes the perfect addition to any Sunday brunch! Okay so Vegan French Toast?!? You are probably wondering “what’s the deal Ceara? !” since eggs are a pretty crucial (ahem main ahem) ingredient in French toast. 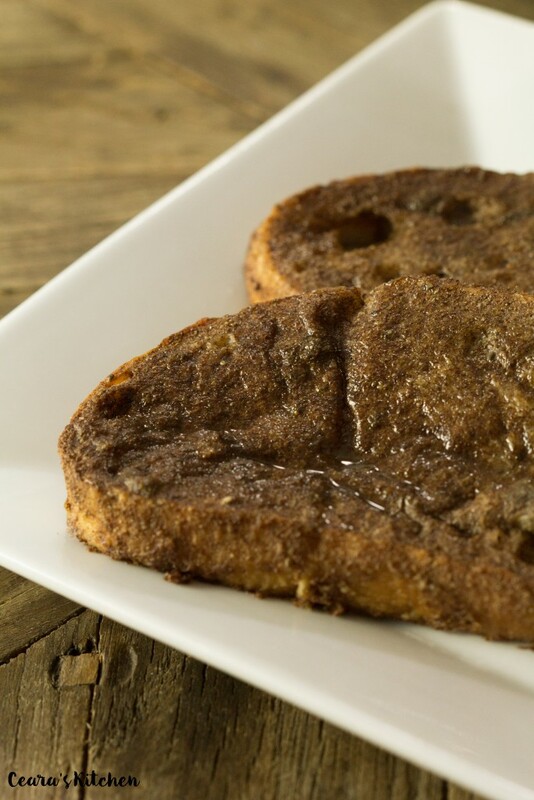 Turns out, just like when you use chia and flax eggs in baking, you can combine ground chia and flax with sweetened vanilla almond milk to make the best Vegan French Toast ever! Leaving the milk mixture to sit in the fridge for thirty minutes is essential to this recipe. The result is a goopy, slightly thickened and milky-egg-like mixture that is perfect for thick bread soaking and French Toast making! This Vegan French Toast reminds me of the French Toast my great granndma “Mémère” used to make for us when we were growing up. Her secret to good french toast was lots of cinamon followed by lots of maple syrup on top. And boyyy was grandma right on both fronts. 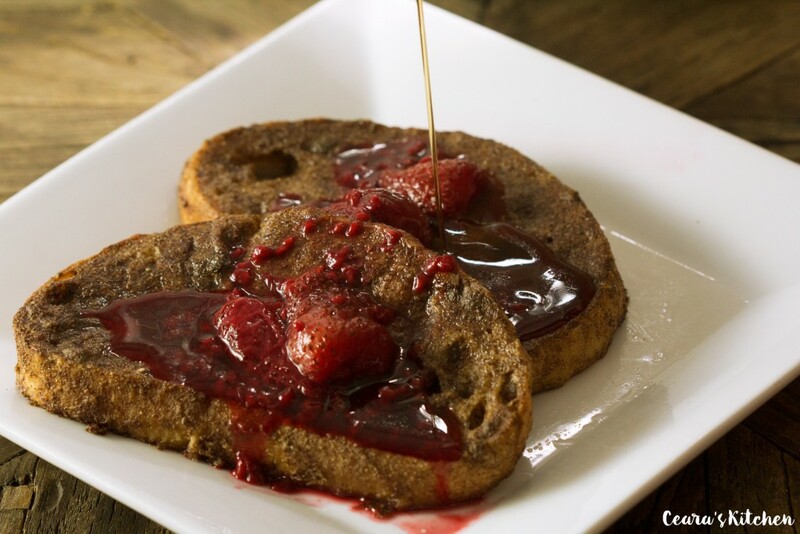 This Vegan French Toast with Berry Compote would not be the same without the additions of cinnamon and maple syrup on top. Like all my recipes, you can adjust the cinnamon to your desired taste. The Refined Sugar Free Berry Compote is technically optional since you can make the Vegan French Toast without it (and just add tons of maple syrup instead, ha!) but I would definitively recommend it. 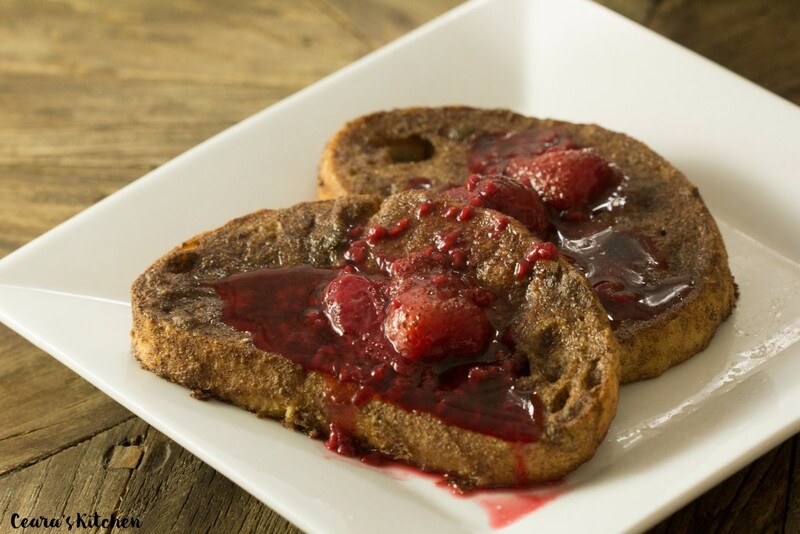 The naturally sweet berry compote soaks right into the cinnamon and vanilla infused French Toast…. Vegan French Toast with Berry Compote is so incredibly soft, eggy and perfectly infused with vanilla and cinnamon. 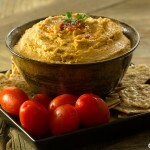 This recipe makes enough to serve a large family. Divide the recipe in half if you are serving less people. If your flax and chia seeds are not already ground, grind them in a spice grinder until fine. Add ground flax seed, ground chia seed, vanilla almond milk, vanilla extract, cinammon and sea salt to a large bowl. Whisk together and leave to chill in the fridge for 30 – 40 minutes until thickened up to a milk and egg consistency. Give an extra stir before dipping the bread. 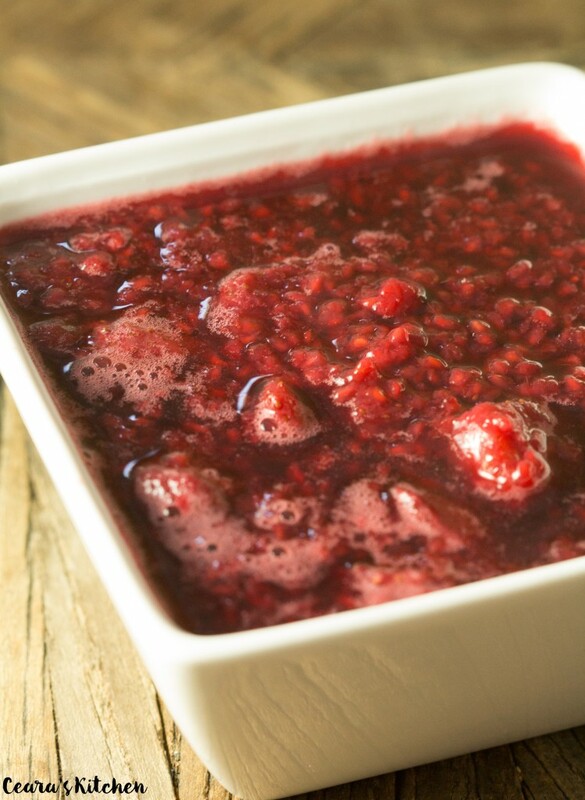 To make the berry compote (if using), remove the stems from the strawberries and chop in half. In a medium pot, simmer strawberries, raspberries, maple syrup and lemon juice on a medium low heat for 30 minutes while preparing the french toast. Preheat oven to 375F/190C. Grease a sheet pan with coconut oil or line with parchment paper. Dip the bread in the milk mixture and leave it to soak for up 10-30 seconds (depending on how dry your bread is). 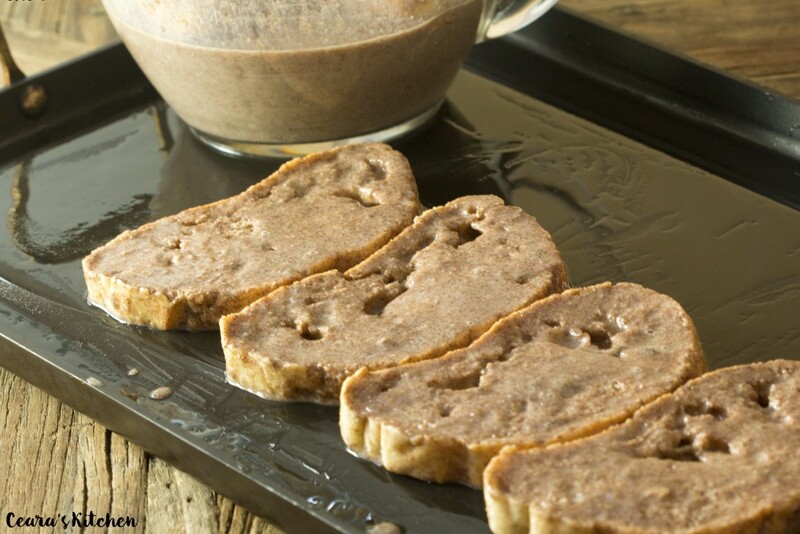 Place milky bread on the pan in a single layer. Continue until all sauce is used up. 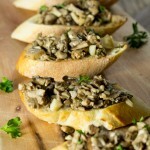 Drizzle any additional sauce on top of bread (up to 1/3 cup – any more will make the bread soggy). Bake in the oven for 35 – 40 minutes until the bread is golden brown on top and the liquid is soaked up. Serve warm and brush with coconut oil. Garnish with berry compote and maple syrup! Enjoy! 1) This recipe works best with vanilla almond milk or regular almond milk. I’ve tried it also with soy milk but the results are not as “eggy” and creamy. If you are using plain almond milk, adjust with extra sweetener and vanilla to taste. [br]2) Reduce the vanilla extract by 1/2 tsp if you are sensitive to vanilla extract in recipes. [br]3) I like to use organic white bread in this recipe but you can experiment with other breads as well (whole wheat, etc.). The amount of slices you use will differ based on the brand of bread you use, how thick it is slices, etc…[br]4) I like using one or two day old bread in this recipe. [br]5) Line pan with parchment paper and do not top french toast with coconut oil for an oil-free version of this recipe. [br]6) Frozen or fresh berries work great in the berry compote. 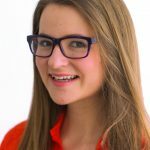 Can I prepare the Chia and flax seed with milk and vanilla the night before !?? I’m always running in the morning ! Me too! 🙂 Thank you so much! These are seriously making me drool right now Ceara! I absolutely love french toast and my hubby really LOVES IT! I make it probably once a month, so not very often since we usually do pancakes. I’ve tried making it different ways but never posted anything. I am SO amazed, I have never seen French toast baked before…seriously, that is an incredible idea. I’ve always just fried it! Wow! I love that you did lots of cinnamon and vanilla too because those are my 2 favorite flavors ever and exactly what I put in mine as well. These are so pretty! This looks great Ceara. I love french toast and I’ve made it with flax and chia before also and always prefer to bake it too. So this recipe is right up my alley. Love it. Great minds think alike, Nissrine! 😉 Thank you! After soaking, could you not just fry it as regular french toast? I don’t like french toast to be soggy, and frying it seems the best way to prevent that…. Hmmmm… you could give it a try! I have never tried it though. I think that baking would be the best option because the bread soaks up the liquid and it crisps a bit on top while baking. I’ve made this french toast in the oven many times and it is NEVER soggy and the perfect texture! Let me know if you end up trying it! <3 Thank you Natalie!! It's all about the cinnamon and sweetnees, xo!